This is the story of my experience diving with the oceans fiercest predator, the Great White Shark... but the real story is what happened after. I traveled to South Africa after winning a safari. I was allowed to bring one person with me and chose my mother since I knew she would appreciate it more than anyone. A van picked us up from our Cape Town hotel at 5:45 in the morning and we started the two-hour drive south to Gansbaai, known as the Great White capital of the world. We signed away our lives over a cup of coffee and received all of the great survival advice (to escape a shark attack, all you have to do is swim faster than the person next to you and a few other gems). Our boat started down the narrow channel between Dyer Island and Geyser Rock. It was instantly apparent what attracted the sharks to this area earning it the nickname “shark alley.” We were surrounded by 60,000 reasons the sharks were there- Cape Fur Seals. I chose the company I went with because they really work to conserve the species by proving that they are not the killing machines that people fear they are. In fact, they are social, intelligent animals which is a far cry from the bloody thirsty monsters they are portrayed as. This group exhibits how misunderstood they are by free diving with the sharks. Movies like Jaws have done no favors for the sharks and only perpetuated their bad reputation. In reality, we are far more dangerous to them than they have ever been to us. While there is no reliable data on how many Great Whites are left, they are listed as Vulnerable by the IUCN. Their population continues to plummet due to over fishing and accidental catching in gill nets. There is a humorous list of things that kill more people each year than sharks which include things such as champagne corks, falling out of bed, coconuts dropping on people’s heads, vending machines falling on angry people and armed toddlers. More people die from trying to get cool selfies each year than from great white sharks. Seagulls and giant petrels circled overhead as we dropped anchor 20 minutes out to sea. They seemed to know they were about to get handouts. The men chummed the water so that the sharks would be attracted to the scent and then the waiting began. We bobbed in 8 foot swells for over an hour making people occasionally go over to the side of the boat to “feed the fish.” There is something so insulting about being sick and the fish joyfully taking advantage of eating your regurgitated breakfast, their smiling faces looking up at you in your weakest moment. They definitely don’t show you that part on the Shark Week documentaries. We decided to move to a different area to see if we had more luck. As soon as the boat moved again, my sea sickness drifted away. We dropped anchor in a new area and started the process again. People were becoming anxious to get in the water and see something. Then it happened- a fin appeared. It sliced through the water as it circled our boat. It was 15 feet long, which was about the length of our boat. My heart dropped as the reality of what we were doing sunk in. The shark cage was lowered into the water. It is not like the steel cages that you see in the movies. This cage looked like it was made of chicken wire. They asked for volunteers and everyone stared at the ground. Get free instagram story templates here! I ended up being the first to go in with a girl I had just met. We pulled on a wet suit and were strapped with a weight belt. They don’t use tanks because the sharks were afraid of the bubbles, a fact that makes me giggle to this day. A large man held me over the cage and dropped me inside. As a shark swam toward the cage, he would shout “down to the right!” and we would let the weight of the belt pull us down just as a shark appeared, bearing its 300 serrated teeth. I peed a little bit each time it happened. I remember the scariest part being climbing back up because we used the cage as a ladder and I didn’t want to put my fingers or toes outside of the cage. It felt like we were inside of a washing machine because the waves were tossing the cage into the side of the boat. That perfect stranger and I came out completely bonded. We didn’t even realize we were clinging to each other for dear life and they had to pull us apart. We were fortunate to have a National Geographic photographer on the boat with us because they were trying to get certain shots for him. They threw out what was called a “cookie” which was basically a cut out of a seal. Great Whites kill their prey by surprising their victims from below and delivering one fatal blow. They then circle back to see what they got. No Great White has ever eaten a human. We are just too bony for them. But humans don’t always survive that “sample bite” and bleed out before reaching the shore. This diving group was trying to prove that when a shark struck a person paddling on a surf board, the shark was mistaking it for a seal. In fact, they had side by side pictures looking up from below, you can only see the dark silhouette and the shape was almost identical. The cookie was used to entice the shark to breach so that the photographer could capture it on film. They are the only shark to display that behavior. My mother came along for the ride but kept reminding me how crazy I was for even wanting to do this. When I got out of the cage and was trying to take off my wet suit and slow my heart rate, I heard cheering. I looked up to see me 70-year-old mother getting dropped into the cage. She turned back to give me a thumbs up. It was a once in a lifetime experience and I couldn’t wait to tell my travel-loving best friend all about it. She was traveling to South Africa with her boyfriend and I told her she couldn’t miss this. The morning of her tour, the weather was not ideal. The water was really rough and they were cancelling tours. She thought she was so fortunate because she and her boyfriend were the last two they allowed on the boat. 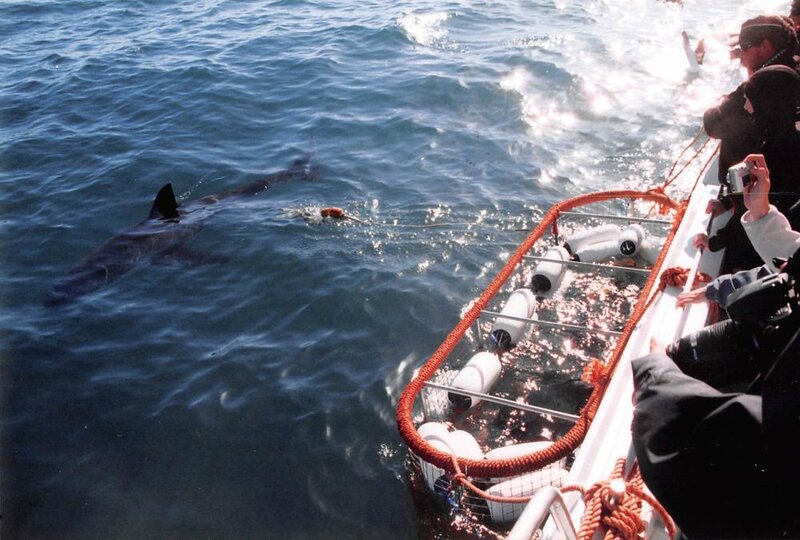 Not long after they set out, they had 10 Great Whites circling the boat and something terrible happened. A nearby boat took a huge wave sideways and capsized. Heads started popping up in the water around the boat. The surrounding tour boats quickly came to scoop panicked people out of the freshly chummed water. Everyone scanned the water looking for more people and her boyfriend, who spoke Afrikaans listened intently to the frantic radio calls from the other boats. He told her how much trouble they were in because they had forgotten to do a head count. They waited around until they didn’t see any more people and afraid they would take another hit, all of the boats headed back to shore. It wasn’t until later that they realized that they had left two people behind. I can’t imagine the fear that they went through. Remember the movie Open Water? Yup, they lived that. There was also a third injured man who died en route to the hospital. The company soon went bankrupt and shut down so is no longer in business. They also found out later that the fishermen didn’t even go out that day because the conditions were too dangerous. The moral of the story is that you have to trust your gut. If something tells you it isn’t safe, listen to that inner voice. Many times tours will continue even though it is not safe, because they don’t want to lose the money. Do your research and find a trustworthy company. Really look at the company you use to make sure that they have good safety ratings as well as good animal welfare ethics. Read reviews and don’t skimp when it comes to your safety. When doing any sort of a dive tour, make sure they have done a head count. Better yet, do your own head count. Safety measures have come a long way since this happened because they learned from their mistakes. We tend to feel like we are invincible when we are traveling, but unfortunately, we are not. And most importantly, never take my travel advice. Laurence’s Bio: Laurence's job with International Animal Rescue has brought her on adventures around the world. She has climbed volcanoes in Nicaragua, hitchhiked across India, trekked through Nepal and rafted down a river in Sumatra. Little did she know, the biggest adventure was yet to come... having children! Although her adventures look much different these days, she was determined to break free from the endless piles of dishes and laundry to show her kids the amazing world around us and hopefully inspire other women to do the same. Would you ever go diving with Great White Sharks? Have you already done it? Let me know in the comments.